How much profit do newsagents make on newspapers? The October newspaper ABC figures were recently published and revealed that the core daily sales were 9.6 million Monday to Saturday, and 10.3 million on Sundays. A further decline and nearly 5 million copies per day less than 1995. Newspaper are sold from around 54,000 and this means that the average newspaper retailer sells 177 papers each day. That's 55 copies of the Sun, 35 Daily Mails, and 29 Daily Mirrors. The annual gross profit for the average newsagent for newspapers sold Monday to Friday is just over £5000 a year with Saturday's contributing £1400 and Sunday's £2500. So for 364 days of selling newspapers, the average retailer shows a gross profit of £9250. They then have the costs of running their business such as staff, rent, rate, lighting etc. In my shop, the daily cost of providing a space for one facing of a national newspaper is around 50p, or £190 per year. 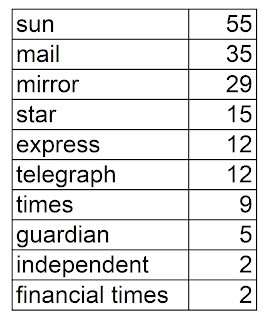 With 12 facings that's £2200 - nearly a quarter of the average newsagents' gross profit. The recent reduction in the cash per copy terms of the Sun coupled with the continued falls in newspaper sales figures has forced me to evaluate how newspapers work in my business. I would suggest that any retailer that wants to stay in the business of selling newspapers should take a look at what they are really worth to them. Something's gone wrong with the figures in this feature. Core sales are not much more than half the numbers quoted, and the average sales per outlet are therefore much lower than those shown here.